Resurrection Sunday is a day of unalloyed triumph for the church. We celebrate Jesus’ victory over the powers of sin and death that could not hold him, and therefore cannot hold us. We know that Jesus has done the work on our behalf such that there is no condemnation for those who are in Christ (Romans 8:1). Though we can do nothing to earn grace, God extends it to us. And on this day, more than any other, we wake with the sunrise, deck out our buildings with flowers and sing “Alleluia” to our risen Lord. Everything is happy, glorious and perfect. Except when it is not. Even as I celebrate the messiah’s resurrection and look forward to my own eventual resurrection, I feel sad. I think, most of all, about my deceased grandfather, whose favorite holiday was Easter. He would mark the day with coconut doughnuts and braunschweiger for his grandchildren. Those happy memories give way to thinking about his last few years, as dementia stole his keen mind and pious demeanor. While I certainly join brothers and sisters in Christ all over the world in celebrating Jesus’ triumph, I miss Grandpa Driver’s strong voice as he belted out his favorite hymns and the bits of shaved coconut that would fall from his doughnut onto his tie and jacket in the fellowship hall. Yet this lingering sadness amid the day’s joy leads me to the greater promises of God. After Jesus had been raised from the dead, the pain and sadness did not cease, even for his closest disciples. Mary Magdalene stood outside the tomb, confused and bereft. Not only had she watched the messiah’s murder by the Roman Empire, but now even his body was gone. But as she remained at the tomb, heavenly beings started to speak to her. At first two angels sitting in the tomb asked her, “Why are you weeping?” (John 20:13). Of all the things they could have said, their first words were to inquire about her emotional state. After answering them, Mary turned around and beheld the risen Jesus, though she did not recognize him. 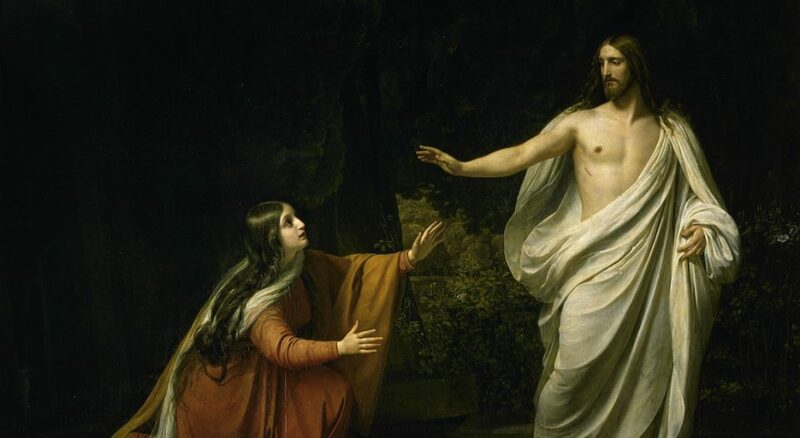 In the Gospel of John, Jesus’ first words after being resurrected echo the angels’ concern for Mary Magdalene’s emotions: “Woman, why are you weeping?” (John 20:15). Even after Jesus defeated death and sin, there was still work to do. And that work began with asking after someone’s feelings and then consoling her. Jesus has always been in the business of reaching out to the hurting and distraught, and I know he will continue until that day when there will be no more hurt. Over the ensuing decades and centuries, the church would have many reasons to feel sadness even as we celebrated our risen Lord. For the community that gathers around the one who overcame death, there remains a strong impetus toward emotional healing. This is because we long for the full dominion of the kingdom of heaven. Jesus did all the work, but the reality of God’s kingdom is yet to be fully manifest. According to the book of Isaiah, when God creates a new heaven and new earth, there will be no weeping or distress (Isaiah 65:19). There will be no more infant mortality, and people dying earlier than their centennial will be a perplexing anomaly (Isaiah 65:20). The key distinction between the messianic era and our own is that God’s people will be glad and rejoice forever, and the “former things shall not be remembered” (Isaiah 65:17-18). The full realization of the kingdom of heaven will be so joyful that we will not even be able to remember the things that once hurt and distressed us. That is what I long for, and the tears I shed while singing “Christ the Lord Is Risen Today” will be only joyful and not mixed with sadness. So on this Resurrection Day, when we celebrate Jesus’ triumph over the grave, I take great comfort in what God has already done. But I also look forward to the completion of God’s redeeming and resurrecting work, when there will be no more sadness at all. Jesus has always been in the business of reaching out to the hurting and distraught, and I know he will continue until that day when there will be no more hurt. I am delighted to imagine that, as much as Grandpa Driver loved Easter, his laughter that I remember so well will ring out more powerfully than ever in the new earth. In the meantime, we are all blessed to celebrate this foretaste of the world to come!